At Premier Dental Group HI, we are passionate about providing patients with exceptional dental care in our five convenient locations. We provide a broad range of dental solutions to suit your entire family. All ages are welcome, from children to adults. Do you wish you had a photo-ready, celebrity smile? Whether you have chipped, stained or missing teeth, we can enhance your smile with our array of high-quality services. These include Invisalign, crowns, dental implants, veneers and teeth whitening. 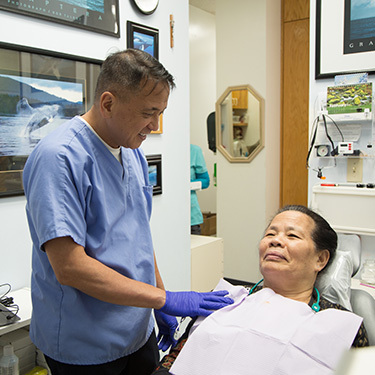 We encourage patients to take a preventative approach to their dental care to keep their teeth and gums healthy for a lifetime. Be sure to get an exam and cleaning every six months and use proper brushing and flossing techniques. In addition to exams and cleanings, we offer a range of general dentistry services including children’s dentistry, fillings, crowns and dentures. Because toothaches, broken teeth and other dental emergencies don’t always occur during business hours, we offer emergency dental care. We also can perform several types of procedures to protect your smile and save your teeth. These include gum disease treatment, oral surgery and root canal treatment. Contact us today to schedule your appointment! Insurance coverage is accepted, and free parking is available on-site.